I noticed there is a leak on or near my property. Who is responsible? 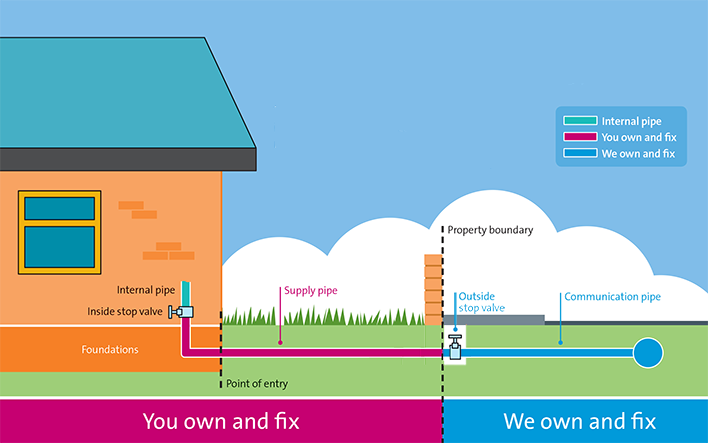 See the illustration below for the division of responsibility.The customer is responsible for repairs to the service (supply) pipe from the curb stop (outside stop valve) to the dwelling regardless of the property boundary line. The outside stop valve may be in a location that is different than depicted in the illustration. If you notice a leak outside of your home call us immediately at (724) 377-2211 or, if after normal business hours, at (724) 632-2200 and we will turn the water off so repairs can be made. All public water systems are required to maintain a minimum chlorine level of 0.02 mg/L (tested at the end of each line) by state law. Systems that use chloramine as a disinfectant must maintain a level of 0.5 mg/L by state law. Our disinfectant levels are tested daily to ensure safety.